Today’s episode features the Cory Weeds Quartet from Vancouver, British Columbia, fronted by Cory Weeds on saxophone and bolstered by guest, jazz pianist David Hazeltine who calls New York City home. Beyond Vancouver, Cory has a strong affinity with New York City. He brought many of that jazz mecca’s top players to his jazz club, and has performed, toured, and recorded with many of them. Among those New York City collaborators is jazz pianist David Hazeltine. Although Cory and David have rarely played together for more than a day or two at a time, in 2018 they embarked on a tour across the western United States and Canada. 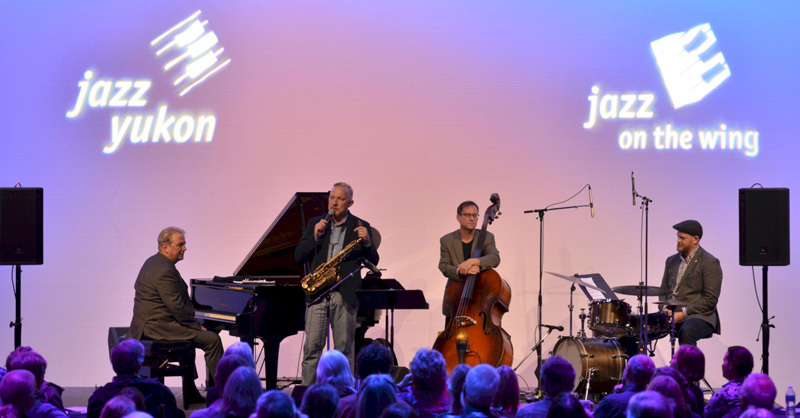 In September the tour reached Whitehorse and the Cory Weeds Quartet with David Hazeltine performed for a “Jazz on the Wing” concert at the Yukon Arts Centre in Whitehorse. Cory is on alto saxophone and David on piano and the quartet is filled out by Vancouver musicians Jesse Cahill on drums and Ken Lister on bass. We recorded this show at the Yukon Arts Centre in Whitehorse in September 2018. We thank the tech staff at the Yukon Arts Centre for their support in making this recording possible and Jazz Yukon for their longstanding dedication to keeping jazz music thriving in the Yukon.